Browsing the blog archives for May, 2012. /Disclaimer/: I am not pretending that the events described in this post have a broader political relevance; they are merely meant to satisfy a political anorak’s curiosities. The last communist councillor in Scotland? On a random Google trip a number of years ago, I was reading up about the long historical tradition of elected communists in Fife. West Fife was one of only two constituencies in the UK that ever elected a Communist Party MP. And not just once either: Willie Gallacher was the constituency’s MP from 1935 to 1950. The only other UK constituency to ever elect a Communist Party MP (see addendum) was London’s Mile End, which elected Phil Piratin in 1945, though he only lasted one term. In the same year, Communist candidate Harry Pollitt failed by only 972 votes to take the Rhondda East constituency in Wales. Rhondda, a mining town, was known as “Little Moscow” – but there were “Little Moscows” in Scotland too. (There’s even one in West-Germany, called Mörfelden). What I got to reading up about, that particular insomniac night, was whatever happened to that once notorious Communist Party of Great Britain (CPGB). Long story short, its leadership opted for reform in the wake of perestroika and eventually disbanded the party, which in turn left various hardline groups within the party outraged and founding or re-establishing separate parties claiming the CPGB’s heritage: the Communist Party of Great Britain (Provisional Central Committee) and the Communist Party of Britain. Anyway, the CPGB’s dissolution must have left a couple of local elected councillors high and dry. At some point I noticed that in 1996, a candidate for a group called the Democratic Left polled 30% in the Scottish Hill of Beath local government by-election. The Democratic Left turned out to be the name of a now long-defunct group set up by the reformist last CPGB General secretary. So I read up about Hill of Beath, which predictably turned out to be an old mining village, though the mine has long closed. There used to be a interesting-looking walking route description online about the old pits there, and I also came across this amusing bit of memoir about a Hill of Beath childhood which features a commemorative Lenin bust. I soon found out, via a link that’s long gone offline, that in nearby Ballingry/Lochore a Communist had actually still been elected in 1990 to the Fife regional council. So now, whenever there are local elections in Scotland, out of sheer curiosity, I always check out what’s happening in Fife. So what did I find this time? Across Scotland, there were still candidates running for the Scottish Socialist Party (SSP), of course, which a mere nine years ago won 7% of the vote Scotland-wide before the whole party fell apart over Sheridan’s scandals. But the party appears to have won all of one council seat this year: Jim Bollan’s on the West Dunbartonshire council. I was looking for something more obscure than that, however: actual communists. The Guardian’s results page for Scottish councils lists no SSP candidates for Fife, but does say that 4 “Independent/Other” candidates were elected, down from 6. Hm. The Fife council website offers more detailed results by ward, but for the overall council it just says that 3 “Independents” were elected, drawing 3.8% of the vote. So I went looking by ward, and this one seemed like a possible suspect: the “The Lochs” ward elected a Labour councillor, an SNP councillor, and one William Clarke, party: Other. This is Cllr. William Clarke. But who is he? 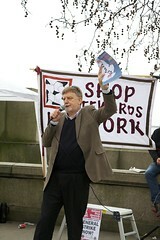 After the demise of the Communist Party of Great Britain in 1992, Councillor Clarke sought re-election under their banner of the Communist Party of Scotland. In 2002, he was elected with 1,291 first preference votes, under a new system, or 95% of the vote in Lochgelly in 2003 in The Lochs ward, more or less the same area he has always represented. Together with another former Communist councillor, the self-styled ‘Democratic Left’ candidate, Alex Maxwell, they have combined in the form of ‘the Left Alliance’, a designation they have assigned to their two man group on the 78 seat Fife council. In the Fife council elections of May 2007, 78 wards were reduced to 23 with three or four councillors to sit in each ward. Maxwell received 1350 first preference votes, by far the highest number, with other successful candidates being spread across the establishment parties. But why doesn’t he show up in this year’s results, then? Alas, Google cache still has the backup of a local news story from last month: “Three retiring councillors from the Cowdenbeath Area Committee were given a warm send-off from the last meeting before the elections by chairman Willie Clarke,” and they included Maxwell. So .. is Willie Clarke, one of three councillors elected in The Lochs ward for the Fife local council, the last Scottish communist standing, in elected office at least? The Guardian’s election results page for English local councils says that the “Socialists” lost their lone councillor among Coventry’s 54 council members. This rang a bell, since I half-remembered something from some other random Googling about locally elected English far-lefties, a few years ago. (Yes, I do a lot of random Googling). Indeed, Wikipedia comes to the rescue: the man who lost his local council seat yesterday was no less than the once-famous/notorious Militant politician Dave Nellist, who was an MP from 1983 til 1992, when he was expelled from the Labour party. After he was expelled, he ran for his seat as an independent Labour candidate and got a decent 29% against the winning official Labour candidate’s 33%. On subsequent successive general election runs, however, he remained stuck at 4-7%. Instead, Nellist and his friends from the Trotskyite Socialist Party focused on the local Coventry council. By 2006, the Socialist Party won all three seats of the heavily deprived St. Michael’s ward. Even the SP’s local success was not to last though, as I already suspected when, at the time, I ended up reading about a massive urban regeneration project in Coventry’s Hillfields neighbourhood, which is within the St. Michael’s ward and would presumably bring yuppies into the area. As it turns out, Nellist’s Socialist Party colleagues in Coventry were defeated in the local elections of 2007 and 2010, respectively. The two SP councillors in London’s Telegraph Hill were kicked out in 2010 too, which appeared largely due to turnout being twice as high as usual – I think because the local elections were held simultaneously with the national ones that year, which benefited Labour. And now, although the vote count was close with the Labour candidate winning by 1,673 votes to Nellist’s 1,469 and Nellist actually got more votes than last time, he is gone too – even from the local stage, ten years after he disappeared from Westminster. But wasn’t there another Socialist Party member and former Militant leader running for something this year? Yes. Liverpool voted for its first elected mayor this year. Labour’s Joe Anderson handily won the race with a whopping 59% of the race. Among the losers, in fifth place: Tony Mulhearn, running on a Trade Unionist and Socialist Coalition (TUSC) ticket, got 4,792 votes, or 4.86% of the vote. 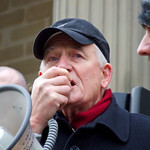 Tony Mulhearn was President of the Liverpool District Labour Party back in the 1980s, and a leading figure in the city council’s volatile fight with Thatcher’s government at the time. Militant was in control of Liverpool’s Labour majority back then, and it set a course for conflict in a bitter budgeting crisis when its councillors refused to make any of the cuts which Thatcher’s reduction of city budgets made necessary. The Militant leaders instead insisted that refusing to pass a budget was the best way to force the national government to give in and fund the needed resorces after all. When Thatcher refused and Liverpool’s money ran out, the council was forced to abruptly sack hundreds of city workers and cease city services, leaving streets filled with rubbish. In a particularly weird part of the story, the city had to rent taxi cabs to deliver termination letters to city employees. I should warn that the above paragraph is from memory. At some point I spent too much time reading through various accounts of these events, some lauding the city council’s principled resistance against Thatcher, others blaming it for chaos engulfing the city, but I’m done digging links back up for now. In any case, the whole episode played a crucial role in the Labour Party under Neil Kinnock deciding to clamp down on the Militant tendency once and for all, eventually leading to Nellist being shown the door too. You are no champagne socialist, I’ll grant you that, but I remember your days back in the 80s, I was at school in Liverpool then. Or at least I should have been, our whole class was always getting sent home as your mismanagement of the schools and political brinkmanship with the livelihoods of your workers led to massive levels of absenteeism amongst the teachers, the buildings, facilities and equipment declined by the day, basic council services weren’t delivered, the streets piled up with rubbish whilst your binmen played football in the park and you, Degsie and your gang of brownshirts went around threatening and physically intimidating anybody who dared to object to your tactics. I’ll never forgive nor forget you for the damage you did to the lifechances of people like myself who were approaching adulthood then. Small wonder that so few of my school generation live in Liverpool now, for the damage your regime did to economic life in the area. The last thing the city needs, after two decades of slow recovery, is you lot rearing your ugly heads again. I’m no Tory, I’ve plenty enough issues with them going back to that era, and I am appalled by the severity of the cuts applied to Liverpool by the current government. But nobody should be under any illusion about where your style of leadership will take the city. We’ve been there before and we shouldn’t forget. That comment, in turn, triggered a flurry of much more favourable recollections. “Liverpool in the 80s was a beacon of hope for the working class and at the time it was more isolated than it would be today,” wrote one counter-commenter. “The Tories, let’s remember, wanted ‘managed decline’ of Liverpool. Labour transformed the fabric of the city [..]. Many Liverpudlians have reason to be glad of the Labour council as they are still living in those council houses – Liverpool built more than the rest of the country put together,” wrote another. “The Liverpool 47 stood up to the Tories and fought for the people of Liverpool,” wrote a third, crediting Mulhearn and his colleagues for “6,300 families rehoused from tenements, flats and maisonettes [..], 4,800 houses and bungalows built, 7,400 houses and flats improved, [..] £10million spent on school improvements, [..] three new parks built, rents frozen for five years”. True or not, it’s twentyfive years later now, and none of that is apparently worth more than 4.9% of the vote, even in once-Militant Liverpool. No, if you like your politics protest-flavored and socialist red, the traditional far left offers little solace. The only comfort for the Trade Unionist and Socialist Coalition (TUSC), which sponsored Nellist’s and Mulhearn’s runs, is that two other TUSC candidates regained local council seats they’d lost last year. In Wallsall in the Midlands, a candidate from the local Democratic Labour Party, a group of far-left socialists led by “Citizen Dave” who were expelled from the Labour Party in the late 90s and recently joined TUSC, won back a council seat after having previously served from 2007-2011; and in Preston, Lancashire, a candidate from that better known British Trotskyist party, the Socialist Workers Party (SWP), won back a council seat after previously serving from 2003-2011. Neither of the two Socialist Party candidates running for constituency seats in the London Assembly got more than 2%. A seemingly new group called People Before Profit (possibly inspired by the energetic Irish group of the same name [EDIT: A commenter has weighed in to say this was not the case]) did a little better: its colourful candidate Barbara Raymond received 5.2% of the vote in her failed run in Lewisham for such a London Assembly seat. That’s about it, though. Instead, you’d want to look at more unorthodox movements. 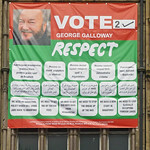 George Galloway’s Respect coalition, fresh off Galloway’s own by-election victory in Bradford West last month which saw him return to the UK parliament after two years, won five local council seats in Bradford yesterday. That’s still just 5 out of the 30 seats that were up for grabs this year, and just 5 of 90 seats on the council overall (Labour has 44 or 45). But it got them plenty of press, since one of the scalps they took was of the Labour Party’s incumbent council leader, as three recounts confirmed, leading Galloway to crow that Respect had “taken the head off the rotten fish that is the Bradford city council”. The Bradford local campaign also drew attention by allegations of physical assaults. A LibDem candidate and a local LibDem MP both made police complaints saying they’d been harrassed by Respect campaigners, and the MP in question compared Respect with the BNP, saying “we got rid of them and we’ll get rid of these thugs too.” Vice versa, a Respect campaigner said he had been assaulted by Labour supporters. The success of Respect in Bradford is rooted in strong support from the local Muslim community, just like it had been in London’s Eastend when Galloway was first elected as Respect MP in the Bethnal Green & Bow constituency. All five newly elected councillors appear to be Muslim. Video footage of Respect’s islamic-green battle bus apparently showed Respect campaigners calling their Labour counterparts “criminals who have murdered a million Iraqis”. The local Respect campaign also came with its own hip-hop track, “Bradford Spring”. Respect did not run candidates in Birmingham, where its candidate Salma Yaqoob got a quarter of the vote when she ran for MP in the Birmingham Hall Green constituency in 2010. Instead, Respect supporters in the largest city of the Midlands should this year vote for Green Party candidates, Yaqoob had said last month. They didn’t listen: Labour won 29 of the 40 seats that were up for grabs this year, and the Green Party none. The electorates which the Greens and Respect appeal to are just too different altogether. There is one more, probably unexpected place a far left afficionado might look: Plaid Cymru, the Welsh nationalist party. 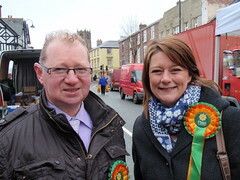 Plaid’s party colour is also green rather than red, but they elected a new party leader just two months ago, and Leanne Wood is a little different from the previous leaders of a party originally associated with romantic nationalism and a fervour to keep the Welsh language alive. She doesn’t even speak Welsh fluently. She’s from the region’s proletarian, Labour-friendly south rather than the more rural expanses further north; she very effectively used social media in her leadership campaign; and she’s a feminist, an anti-war activist, a socialist, and a republican. (She was once ordered to leave the Welsh Assembly after she called the Queen “Mrs. Windsor”). In fact, Wood is from Rhondda, Wales’ own former “Little Moscow”. Unfortunately, Plaid fared rather poorly yesterday. With Labour romping home across much of Wales, Plaid had to concede some 41 of its 199 previous council seats. In Wood’s native Rhondda, Plaid actually lost half of its 18 seats, with Labour increasing its share from 48 to 60 (and the Tories holding just 1). Still, the 158 council seats Plaid has left is a hell of a lot more than Respect, TUSC and all the other left-of-Labour socialists together could hope to collect in many years. Even the Green Party, which looks set to win an additional 11 seats to get a total of 40 across England and Wales, doesn’t come close. Labour, meanwhile? It seems set to win an extra 800+ seats or so yesterday alone, and will have well over 2,000 council seats across England and Wales after these elections. Even with the newly fragmented British electorate, everyone else on the left is just tinkering on the margins.